Despite the popular caricature that librarians spent all their time telling people to “Ssshhh” I can only recall seeing “Silence” notices in two libraries. This may be because my background is mainly in public rather than academic libraries, but it is interesting that the only libraries where I can recall seeing silence notices are both theological collections: the libraries of Spurgeon’s College and the London School of Theology. On Thursday 8 September 2016 four members of CLIS took part in a visit to the Library of the London School of Theology, in Northwood, Middlesex where we were the guests of the Librarian, Keith Lang. LST has an extensive library of some 50,000 volumes, not to mention pamphlets, tapes and back runs of periodicals, some of the latter dating back a hundred years. There is also an extensive collection of dissertations written by former students. The library is catalogued on the Capita (formerly Talis) library management system and can be accessed on a variety of computers and mobile devices. LST was originally founded in the 1940s as the London Bible College and was intended to provide a counterweight to the prevailing liberal theology of the day. After some years based in central London in 1970 the college acquired the site vacated by the London College of Divinity (which had moved to Nottingham and become St. John’s College). LBC/LST has played a major role in re-establishing evangelical scholarship and has many distinguished past students, teaching staff and principals. As we were escorted along corridors to the library we were able to admire the many portraits of leading figures who have taught at the college or been awarded regular or honorary degrees by the institution. These include such diverse figures as John Stott, Graham Kendrick, and Gilbert Kirby. The library has fully embraced technology and, at the time of our visit, was about to implement self-service equipment using the RFID system. These days many of the students own their own laptops or mobile devices but the library also provides a print room in which students without their own equipment can use PCs and print out documents. The library contains special collections of materials in various subject areas. There is a growing collection of books on psychology and counselling and on ethical questions such as homosexuality. Keith Lang believes that, although the biblical teaching is clear on many of these issues it needs to be re-interpreted and re-applied in every generation. 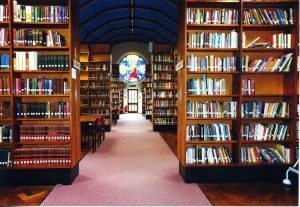 At one time the college housed a study centre on Islamic studies and although this is no longer operating, the library still has much material on the Christian response to the Muslim faith. Keith made an interesting observation on the treatment of the Koran in libraries. When I worked for the public library service in Wandsworth we were instructed at one point not to place the Muslim holy book on bottom shelves in order not to give offence to Muslims. However, Keith pointed out that, according to strict Islamic thought, the Koran is really only the Koran in the original Arabic text. English versions are translations, not the real thing. Keith is also interested in building up a collection of materials on Pentecostalism including resources not immediately available elsewhere. The books are classified by the college’s own unique classification system and are housed on metal shelving said to be worth £15,000 which Keith was able to acquire for nothing from a library that was closing down. One highlight of the afternoon was a visit to the archive room which includes an edition of the Book of Common Prayer dating from 1666, the year of the Great Fire of London. This is said to be worth in the region of £3000. Other intriguing items held in this room include the last surviving LST Christmas hat! The personal papers of the leading evangelical scholar, Donald Guthrie, are also stored here. Keith suggested that the musty smell of old books may have an addictive quality and this may be caused by unseen microbes lodged within their pages! 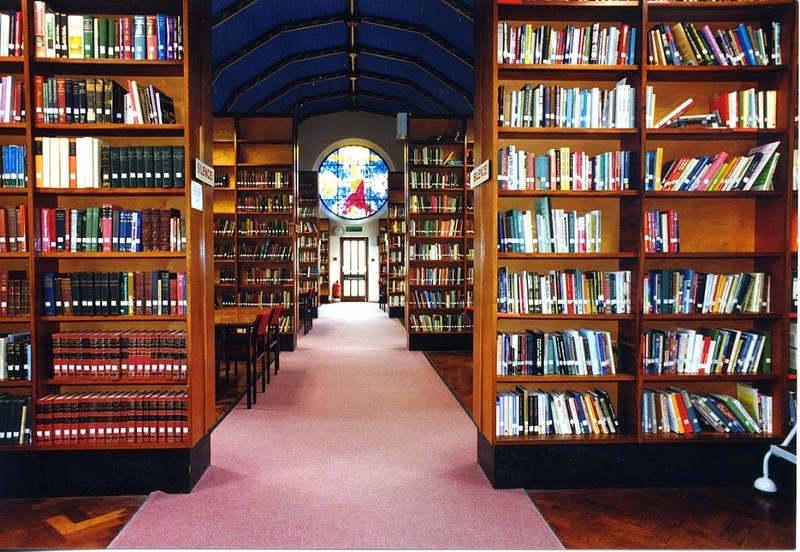 Part of the library is housed in the former chapel of the London College of Divinity. There is some concern that some of the images that decorate the wall may be masonic symbols. This suggests to me that there may have been a time when evangelical Christians were less hostile to freemasonry than they often are at present. I am reminded that the first great conference of the Evangelical Alliance, back in 1846, took place in London’s Freemasons Hall, a choice of venue that might raise a few eyebrows if repeated today. The former chapel has a chapel bell and there is a student tradition that the bell is rung each summer at the end of examinations. Keith Lang, the Librarian, has a varied background with a university degree in engineering and a past history as a primary school teacher before entering the library profession. It is encouraging that many Christian colleges now employ professional librarians. I can recall enquiring about a possible job at the London Bible College, back in the 1980s, and being told by the then principal that the College couldn’t possibly afford to hire someone just to look after the library. Their library was an additional responsibility for one of the teaching staff. Despite this, many theological colleges are struggling and St. John’s College, Nottingham, no longer offers residential courses. LST, however, had 50-60 students graduating last year, twenty of them with first degrees. Our visit to the LST concluded with refreshments in a common room and the opportunity to ask further questions. We are grateful to Keith Lang for his time and attention and to Robert Foster who handled much of the administration for the visit and for the preceding lunch in a local Italian restaurant. Graham Hedges, Hon. FCLIP, MCLIP, is Secretary of Christians in Library and Information Services.